With the weather warming up, it’s easy to start dreaming about spending days by the beach. If you’ve ever thought about moving beachside to make the most of summer but held off because you thought you ‘can’t afford that kind of lifestyle’, maybe think again. There are still a number of affordable beachside suburbs, in most regions, that will keep your dreams of living seaside alive. To help you out, we’ve put together a list of the cheapest to rent a room. Although these suburbs are the cheapest, they might not be the most convenient. If there is one downside to spending an affordable summer living by the beach, it will be commute times. If you’re after a dirt cheap room next to the sea, then Maslin Beach is the suburb for you. Granted, it is a fair distance from the city and amenities are scarce, however, at a paltry $148 per week it’s 33% cheaper than the most expensive suburb West Beach. It should also be noted that Maslin Beach is a designated nudie spot– which may or may not influence your decision. Those looking to live a little closer to the action should consider Glenelg North, which with an average room rent of $171, is the cheapest beach suburb within 10km of the city. Despite being bookended by arguably two of the best beach regions in Australia— Sunshine and Gold Coasts— Brisbane itself has few notable beaches. For the purposes of this list, seaside suburbs were considered—with Redland Bay coming in as the cheapest at $165 per week. Those wanting to live near a swimmable beach at a reasonable price, however, should consider Margate which is approximately 40-minutes drive north from the city centre. If living by a picturesque surf beach is the goal and commuting doesn’t bother you, check out the Sunshine Coast or Gold Coast lists. Scoring a room on a Gold Coast beach can be difficult and pretty costly when compared to the rest of the country. Most beachside suburbs along the strip are now commanding average room prices of over $200 a week, with Currumbin topping the list at $233 per week. The cheapest suburbs are all to the southern end of the coast, with Bilinga being the most affordable at $184 per week—making it not only one of the cheapest suburbs on the beach but for the whole region. If you’re keen to be in the thick of it, Burleigh Heads is the most affordable central suburb and will set you back an average of $206 per week for a room. With bayside areas closest to city ranking as some of the most expensive suburbs in Melbourne, sharers will have to try farther out to find something cheap. Chelsea, around 30km south of Melbourne CBD, comes in as the cheapest suburb at a reasonable $179 per week on average—almost half the cost of renting in St Kilda. For a compromise on price and location, however, Mentone is just 20km from the city centre and has an average room rent of $190. Perth not only offers up some of the prettiest beaches on this list, it also has the cheapest. With an average room rent of just $136 per week, Eglinton is the best option for those who wish to be seaside on a minuscule budget. Inconveniently though, the suburb is a good 50km from the city which may not suit everyone—particularly those without transport. 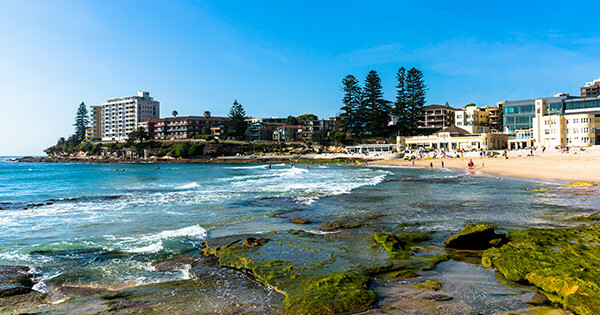 At a more reasonable 25km from the city, Coogee is the closest beachside suburb on the list and offers up an average room rent of $176 per week. Rooms near the beach on the Sunshine Coast are plentiful and reasonably priced when compared with neighbouring regions to the south. Bokarina is the cheapest beachside suburb by far, with an average room price of just $156—around 41% cheaper than the most expensive, Noosa Heads. Like Bokarina, most affordable suburbs on the coast are located to the southern end around Kawana and Caloundra. Those wishing to live centrally, however, in the Mooloolaba to Maroochydore stretch will need to shell out an average of $182- $189 per week for a room. Before we start, let’s just get this out of the way. Sydney. Is. Expensive. If you’ve read through the other regions you might have noticed that the cheapest room in Sydney is almost double that of the others and finding a cheap room can be tough—let-alone by the beach. Thankfully, there are still a few reasonably priced suburbs that Sydneysiders can take advantage of. Cronulla is easily the cheapest of them at $262 per week—a bargain when compared with Bondi at $336 or the most expensive beach, Manly at $356. If you desire to be as close to the city as possible without going over $300 a week, then Maroubra is your go to beach with rooms averaging $286 per week. Room prices are based on listings created on Flatmates.com.au from Feb - Aug 2016.